DU PG Admit Card 2018 :Delhi University has released the UG and PG Admit Cards for June/July examinations. 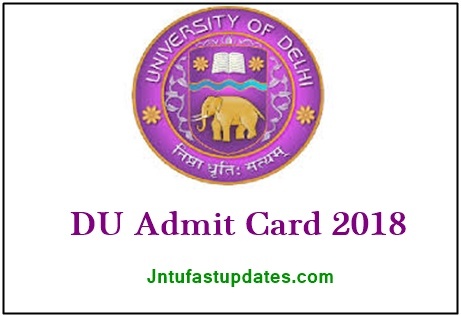 Students waiting to get admission in Delhi University and the aspirants who have already applied for the admission test can download Delhi University admit card from the official website, du.ac.in. Candidates can get the Delhi University hall ticket 2018 from today, 14th June. As it is the mandatory form required to carry to the examination, all the competitors must download DU Hall ticket 2018 and preserve it safe to carry to the examination. Without verifying the hall ticket and identity of the candidate, the officials will not let the candidates carry forward with the examination. Hence the competitors who are going to appear for the UG/PG admission tests in Delhi University can get the hall tickets from DU site and keep them safe. Delhi University is also known as Central University; the university was formed in 1922 by an act of central legislative assembly. The Central University is situated in New Delhi, India. This is one of the most reputed and popular universities in India. Under affiliation of Delhi University, 77 colleges and 5 institutes working. On aggregate, 132,000 regular students and 261,000 non-formal students were coming out annually with certification from the Central University. Yearly, the DU offers admission for students into various Undergraduate and Postgraduate programmes. It offers admission purely on the basis of merit. The Delhi University has scheduled the UG and PG entrance tests in the 3rd week of June. As per the scheduled time table, the Delhi University is going to organize the exams for UG PG courses from 17th June to 21st June; Candidates going to attend the examinations can check the Delhi University UG and PG Examination Schedule 2018 in detail from the PDF file attached below. Candidates applied for Delhi University can get their hall ticket/admit card from the official website, du.ac.in. The DU entrance test hall ticket is presently accessible to download for UG and PG courses. Candidates can hurry up to download the hall ticket. It contains the most important information such as examination center, date and time of examination, and also it consists information about the candidate’s name, register/hall ticket number, father’s name, date of birth, signature, photo, and other particulars. Aspirants can go through the hall ticket and can check all the details keenly. Login with the Above link & Download DU PG admit card. Candidates must catty any of the valid identity proof copy such as Aadhar Card, PAN Card, Voter ID card, Driving Licence or any others along with the hall ticket. Candidates have to project it at the time of verification. Otherwise, they may lose the chance to attend the examination. For more instructions and guidelines, students can refer to the Delhi University website, du.ac.in before going to the examination. Step 2: On the homepage, search for ‘ DU PG Hall Ticket 2018’ link. Step 3: Click on the link and enter the required details such as register ID, Password etc. Step 4: After giving the accurate details, click on ‘Download’ Button. Step 5: The Hall ticket gets downloaded. Once check the details from the hall ticket and take a printout of it. Keep it in a safe folder to carry it to the examination. Sir whats the problem with admit card facility……my exam is on 17 ….n my home is about 400 km from delhi …..so what to do….what the hell things u r doing????? The document is still not available. It still shows the XML file tree is not available. Yet the admit card is issued What is the problem??? with the URL ???? I also facing the same problem.i dont know why it is happening. Admit cards are not released yet. when the entrance admit card for du 2018 B.A. (Hons.) Humanities and Social Sciences will issued. Admit card is not released yet?? ?